At the Australian Centre for Egyptology, we often receive enquiries for historical information from school students and budding Egyptologists. 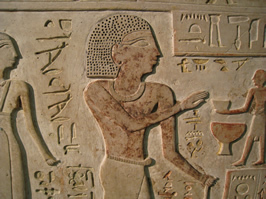 We therefore thought it would be worthwhile putting together some pages dedicated to resources on Ancient Egypt - spanning the language, daily life, religious beliefs and art, as well as more practical matters, such as what you need to do to become an Egyptologist. Please visit these sites first before considering contacting us - you will probably find your answers here!